It began with an 18-week prison sentence and one man's fury after his girlfriend left him. It ended in the most extraordinary manhunt seen in the UK for many years. Raoul Thomas Moat's one-man war against society is over. There will be an inquest into how Northumbria Police handled the affair - but whatever the outcome of that, at least it ended the way they wanted it to: their suspect contained, surrounded and no longer capable of leaving people terrified. The Raoul Moat emergency began almost unnoticed on Thursday 1 July. HM Prison Durham opened its gates and the former nightclub bouncer walked free after serving a short sentence for assault. But the previous month, he had learned that his relationship with on-off girlfriend Samantha Stobbart was, finally, off. He left a message on Facebook saying, "Watch and see what happens". The following day, the prison contacted police to warn them that they thought Moat might pose a danger to Ms Stobbart. In the early hours of last Saturday morning, Ms Stobbart was shot at a house in Birtley, Gateshead. Chris Brown, her new boyfriend, was also shot just outside the house and died from his injuries. The next night Pc David Rathband, a patrolling officer in uniform, was shot through the window of his car in the west end of Newcastle. He managed to call for help - but his attacker fled the scene. Detectives at Northumbria Police knew by then that they had a major incident on their hands - and there was no greater confirmation than the letter Moat left with a friend, detailing his grudges. "Last night I called 999 and declared war on Northumbria Police before shooting an officer," he wrote. "Rang again and told them they're gonna pay for what they've done to me and Sam. I went straight but they couldn't let it go. The public need not fear me but the police should as I won't stop till I'm dead." Over the coming days, Moat became Britain's most wanted man and kept on the move. Day after day he avoided capture - while detectives tried to work out how to snare him. Along the way, he was suspected of the armed robbery of a fish and chip shop in Seaton Delaval, near Blyth - but by the middle of the week, all attention had turned to the small market town of Rothbury, on the edge of the Northumberland National Park. On Wednesday, police revealed that they had found what they believed to be Moat's makeshift camp. By the remains of a fire was another letter left behind for Samantha. A press conference was called and detectives pleaded with Moat to give himself up. Det Ch Supt Neil Adamson told the suspect he was wrong - and Sam wasn't seeing a police officer. At the same time, some of the nation's top police marksmen were flooding into the area to join the expanding hunt. The Metropolitan Police sent 40 of its elite firearms officers - the most highly-experienced marksmen and women in the country, trained to confront suicide bombers and to take split-second decisions on when to pull the trigger. Northern Ireland despatched 20 armoured cars on an evening ferry: vehicles designed to withstand an attack by armed paramilitaries. Air and land exclusion zones were established over Rothbury as officers tried to narrow their search with the help of an RAF Tornado fitted with imaging equipment. An "associate" of Moat's was enlisted to help the police. Moat's uncle, Charlie Alexander, offered to do whatever he could to make the bouncer turn himself in. By Thursday, four people had been arrested in connection with the inquiry - and it emerged that Moat had made wider threats against the public as a whole. At about 2000 BST on Friday, police sealed off an area of Rothbury near the River Coquet. They had cornered an armed man who fitted Moat's description. 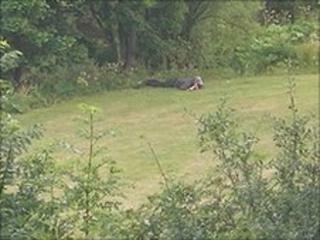 A witness revealed that the man, surrounded by police, had quietly lain down and pressed the gun against his own neck. Just hours before, Moat had been like a needle in a haystack. Now he was contained, separated from the public, with nowhere left to go. The waiting began. Some local people were locked inside their homes inside the exclusion zone, including a wedding party of 100 unable to leave a hotel. And the waiting went on. British firearms officers are trained to do two things: react instantly if required - but wait for an eternity if need be. There was no chance that the suspect could flee. Officers armed with handguns, specialist MP5 sub-machine guns and electro-shock Taser weapons were just 20ft away. It was a text-book situation: a controlled "sterile" area where the police have the upper hand - but the suspect has all the time in the world to think things through. As the officers settled in for the night, lights were brought in by the fire service. And then it was over to Raoul Moat. Body builder, jilted lover, Britain's most wanted man, cornered after a manhunt that had gripped the nation. It appears he chose to put an end to this saga by turning his gun on himself.